Photo courtesy of Norrie Mcnamee. Opened in former Riddell's skating rink. Now demolished. Demolition gallery here, courtesy of George Basterfield and Eric Morrice. 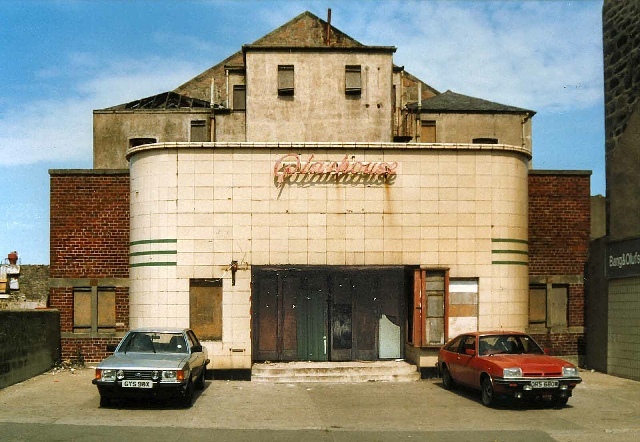 Fraserburgh's new kinema, the Playhouse, which was opened at the beginning of March, is due to the enterprise of Caledonian Associated Cinemas, Ltd., Major Cattanach, of Kingussie being the architect. 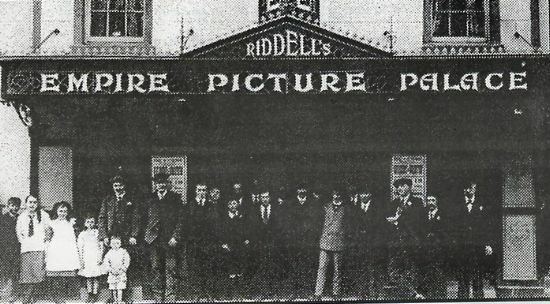 Work on the erection of the kinema has been carried out since last autumn, when the former buildings were acquired. Houses which stood on the site have been removed, and in their place there now stands in High Street the handsome cream frontage. The floors and steps of the entrance hall are finished in a fine design of terrazzo in delicate shades of creamy white, bordered with green and black, which harmonises with the wall colours and gives an air of luxury to the hall. Through wide doors entrance is gained to a comfortable foyer of 30ft width, from which a double staircase rises to the balcony. The colour scheme is pleasing and restful to the eye, the hall and staircase being tinted in two tones of fresh green over the mahogany dado. Silver, orange, emerald and violet, painted in a light filigree design, break the plain surface, and give an interest to the whole design. The architectural lines of the auditorium have been accentuated by the scheme of colours, which is based on orange tints, gold green and black in well-disposed touches. The auditorium is seated with the latest type of tip-up chairs. In the balcony, the chairs are coloured green to match the surroundings, the back stalls are finished in brown moquette and the front stalls are blue. The balcony has accomodation for 261 persons and the stalls for 774, so that the total seating capacity is 1,035. Alfred Harold (Uniforms) Ltd., were responsible for the dressing of the staff here, the male staff being in emerald green with gold braid and the girls in green trimmed blue and gold. A well-equipped and spacious projection room is incorporated in the Playhouse in which Kalee projectors are installed, operating with BTH sound. 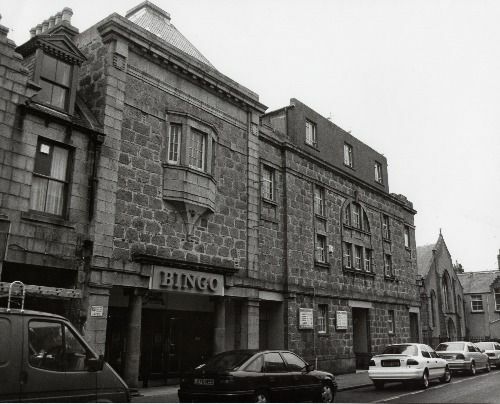 Contractos for work in this theatre included: Joinery and masonry, R Perk, Montrose; decorating, A McDonald, Forres; electrical installation, TC Smith, Aberdeen.